Imagine taking a really fast photograph of a light beam. Suppose you could image the electric field. You might get a picture like this. Download "Imagine taking a really fast photograph of a light beam. Suppose you could image the electric field. You might get a picture like this." 1 What does Color Temperature Mean? 1 Picture yourself buying a fluorescent light at the local hardware store. The very first question you must answer is what color temperature do you need for your bulb? Color temperature? This sounds as though color and temperature are related. Is a red rose merely pink when the temperature is 20 C (68 F) but purple when the temperature goes to 40 C (104 F)? No, certainly not. But the physical response a person has to light (Color) and the thermal effect on an object's light emission (Temperature) must be examined. Basics: Light beams are made up of electric and magnetic fields pointing first one direction, reversing to point the other way, then repeating the pattern again. Imagine taking a really fast photograph of a light beam. Suppose you could image the electric field. You might get a picture like this. FIg. 1 If you could photograph the electric field in a beam of green light, it might look like this. (Entire pattern moving at c, the speed of light) Wavelength of light The distance between pattern repetition pointes in the freeze-action picture is called the wavelength. For our image of green light, the wavelength is about 520 nm (nano meters). For the metrically disadvantaged, a meter is 10% longer than a yard; 520 nm is 520 one-billionths of a meter, or 0.52 millionths, m long. Each color in the rainbow has its own unique wavelength. Light and sound waves are similar Sound and light are similar in that they are both wave actions. Sound is also characterized by wavelengths (tones) and is capable of being produced by any combination of very long to very short wavelengths (low to high tones). Sometimes sound is described by its wavelength, sometimes its frequency; sometimes light is described by its wavelength, sometimes by its frequency (related to its energy). Vision: We humans hear pure notes of sound. Our music is the pattern of varying intensity for every tone possible to make and hear. If, instead, we heard sound the way we see light, our music would be composed of a single chord of same three tones; the complex of musical experience would be formed from the different loudnesses of each tone. This difference between hearing notes but seeing chords confuses understanding of how we actually do see. Human vision is due to photo-stimulation of rod or cone vision cells on the retina. Cones are sensitive at low light intensities and do not function in full daylight, because their photo-sensitive chemicals are depleted. They provide night vision after the depleted chemicals have regenerated. Rods occur in 3 varieties: L, sensitive to long wave- Fig 2. Response of rods and cones to light lengths and peaking at orange (580 nm); M, functioning at medium wavelengths and peaking at lemon yellow-green (550 nm); S, responding to short wavelengths, peaking in blue (440 nm) and extending into deep violet. Rods are much less sensitive than cones, they only function during brighter conditions. 5 What does Color Temperature Mean? 5 If you compare blackbody glow spectra to our visual sensitivity, you will come up with the plot of Figure 11. 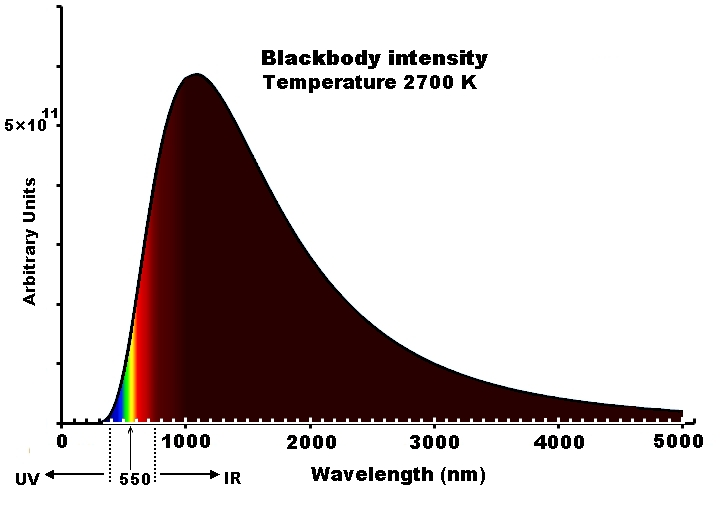 Blackbody temperatures are marked along the curve and and overlays the visual color point. This is result is from the 1931 report by the CIE (Commission Internationale de l'eclairage). About the web link Blackbody emission is sometimes called Planckian emission, as in this Wikipedia page. For temperatures below 1500 K, most of the radiation is in the very deep IR, showing little overlap with visible sensitivity. The human body has peak radiation at nm (10 µm). 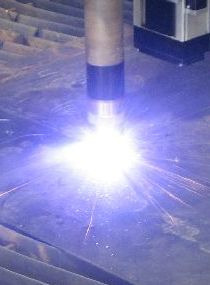 For temperatures above 5000 K, high UV emission occurs and safety procedures are necessary. Fig. 11 Color Temperature for various BB temperatures Blackbody emission is the most efficient radiation that occurs. It requires a special set up to produce and is used mainly as the basis for various comparisons. What Is Heat? What Is Heat? ATOMIC SPECTRA. Apparatus: Optical spectrometer, spectral tubes, power supply, incandescent lamp, bottles of dyed water, elevating jack or block. Name: Class: Date: Grade 11A Science Related Reading/Physics Conduction, Convention & Radiation Physics Gr11A Pre Reading Activity Using prior knowledge, write the definition for each vocabulary term. Why Use Fiber Optics For Lighting? What is global warming? Global Warming and Greenhouse Gases Imagine you live in a timber shack in Alaska. It's chilly up there, so you build yourself a huge log fire and pile on all the wood you can find. Our Sun: the view from outside 1. The Sun is hot. Really hot. The visible "surface" of the Sun, called the photosphere, has a temperature of about 5800 Kelvin. That's equivalent to roughly 10,000 Fahrenheit.